The Power and The Passion presentation will include three nightly themes. 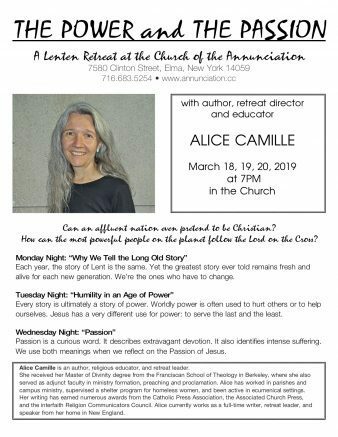 Author, retreat director and educator Alice Camille will present a three-day Lenten retreat titled “The Power and The Passion” at 7 p.m. March 18-20 in the Church of the Annunciation, 7580 Clinton St., Elma. Camille received her Master of Divinity degree from the Franciscan School of Theology in Berkeley, where she also served as adjunct faculty in ministry formation, preaching and proclamation. She has worked in parishes and campus ministry, supervised a shelter program for homeless women and has been active in ecumenical settings. Her writings in numerous publications have earned many awards from the Catholic Press Association, Associated Church Press and the interfaith Religion Communicators Council. She currently works as a full-time writer, retreat leader and speaker from her home in New England. Monday Night: Why We Tell the Long Old Story: Each year, the story of Lent is the same. Yet the greatest story ever told remains fresh and alive for each new generation. We’re the ones who have to change. Tuesday Night: Humility in an Age of Power: Every story is ultimately a story of power. Worldly power is often used to hurt others or to help ourselves. Jesus has a very different use for power, to serve the last and the least. Wednesday Night: Passion: Passion is a curious word that describes extravagant devotion. It also identifies intense suffering. We use both meanings when we reflect on the Passion of Jesus. The Power and The Passion is free and open to the public (freewill donations would be appreciated), and a reception will follow each presentation. For more information, please call 683-5254 or visit www.annunciation.cc. Be the first to comment on "Award-winning writer to offer Lenten retreat at Annunciation Church in Elma"